Many forms of creature ranging from animal cells to bacteria or viruses possess sugar chains on their surfaces. Sugar chains show a diversity of structures that contain the unknown at present. The sugar chains are related to many biologically important functions, such as blood types, fertilization, differentiation of egg, organogenesis, cell proliferation, programmed cell death, neurotransmission, differentiation of bone marrow cells to leukocytes or erythrocytes, immune response of lymphocytes and self or non-self recognition between different cells. As described above, we are interested in all phenomena that may be related with sugar chains. 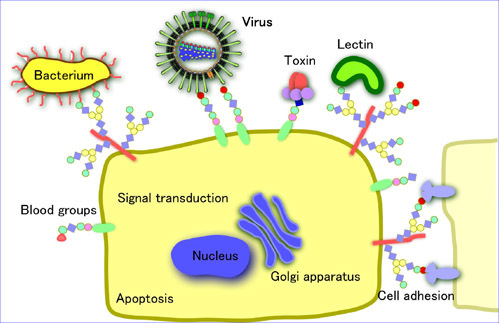 Especially, we are investigating the role of glycoconjugates and related matters involved in important diseases such as infectious diseases of virus in the levels of molecules and genes.